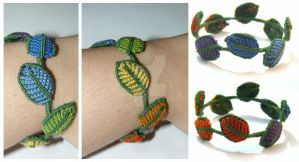 Bracelet: Made using tiger eye beads, seed beads, cotton cord, and an acrylic button. The button closure can function as a hidden pentagram/pentacle for those who walk that path. All my available work can be purchased at Nay-Nay Macrame. -Tigers Eye is the stone of courage, strength and will power. If a student is serious seeking to work with gemstones that will help manifest desires, then Tigers Eye is your best choice. Its deep brown color represents its strong grounding and stabilizing effects. This is the gemstones for the dreamer, the one that wants to materialize their dreams to concrete reality. Understanding the meaning of tiger’s eye stones is a matter of looking at the physical properties of this crystal. The deep brown color represents the connection with the grounding, stabilizing, practical energies of the earth. The properties of this gemstones is perfect for the entrepreneurs full of ideas, but never following through and executing. Tigers Eye will help clarify your visions and amplify your intentions. It helps you face and overcome difficult challenges and stick to your plans, despite discouraging setbacks. For this reason it is sometimes marketed as a gem that brings professional and financial success. -Tiger Eye is the gemstone for the sun sign Gemini. -Tiger’s eye is very effective on the Solar Plexus or 3rd chakra. - tigers eye can also help balance and clear emotions, thus contributing to a calm mind and peaceful disposition. -Tiger's Eye is a stone of protection and was traditionally carried as a talisman against ill wishes and curses. It is both a grounding and uplifting crystal and can encourage feelings of self-worth and confidence in our own abilities. It can promote a positive attitude, assist us in accomplishing our goals and help us to recognise our own talents and abilities. -Tiger's Eye is said to enhance our own personal power, release blocked creativity, and to bring good luck, prosperity, wealth and success. -Tiger's Eye can be used to help balance the Solar Plexus Chakra. I'd love to get myself one of those, it's beautiful. Love the bronze tree ornament attached to it and the tiger eye stone. They've both sold, but once have and recover from my wrist surgery I may take up jewelry making again. Perhaps a commission may be my first new creation. I dont' make the pendants, just the jewelry. This is so beautiful! The colours are wonderfully balanced and I love the flow of the stones and knotwork. This is stunning. I love the colors of nature, and just looking at this set calms me. I really love this so much! It came in the mail today! The choker sold in seven hours. Personal record broken! WOOT! Now I want to see more of my stuff sell, especially older items. I have a commission lined up because of this piece. You'll see the same combo this weekend as a necklace. That is super exciting on both counts! I noticed that in the comments heheh. The universe has a funny way of giving us messages. I'm sorry to hear you didn't get it, but I have more pieces lined up after this commission. Hopefully you'll see another that you love. Wow that was fast xD And I see you got a commission for something similar too! This color combo is quite nice xD Must be why! Oh, wow. These are gorgeous. It's too bad my sweetie doesn't like chokers, or I'd totally buy this for her. How easy/difficult would it be to make a necklace in a similar pattern to the choker, but that would lie flat? I think she'd love the colors and the pendant--she just doesn't like the feeling of chokers on her neck. Is a necklace that would lie flat. I can alter the pattern for various beads and pendants. I have on copper colored tree of life pendant left. The cost will be around $35 without tiger eye beads. With the tiger eye beads it'll cost $45. I have various pendants available and posted in my scraps if you want a different pendant used. That would be perfect! Same colors as the choker, but in that pattern with Tiger Eye and the Tree of Life is exactly what I want. $45 it is! Do you need any part of that up front? Typically 50%. I'll put a posting on my etsy page naynaymacrame.etsy.com for the prepayment and will start work on it right away. The pattern will be slightly different because of the tiger eye beads. They have a very small drilled hole and I can fit only one cord instead of two though them. I should have it finished by Saturday. I have carpal tunnel and that slows down my pace. Note me with measurements so I know how long to make the neck part. If it's too small it'll end up fitting like a choker. I'll also need to know "tall" to make it, aka where the pendant will drop at. Note me with the info while I set up the etsy listing. Okay. It may be a day or two, as my sweetie is out of town until Wednesday. But I will get it to you as soon as I am able. I have the listing posted for prepayment: www.etsy.com/listing/180922248…; I'll start on it once I have the prepayment and measurements. Oh, excellent. I will go check that out, then. Oooooh this is beautiful! I love tigerseye, and those frosted blue-green beads that you used are gorgeous! Magick lives inside all of us.